Alsacian wines: variety or not on the label? Jean-Michel Deiss, head of the famous Marcel Deiss Domain, does not mention the variety on the front label. The mention figures only on the back label. 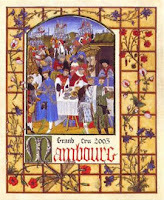 On the front label customers read the “Grand cru” mention, the vintage and the “terroir”, Mambourg. One could assume that only a very erudite consumer would know that on the Mambourg terroir grow mostly Riesling and Pinot blanc. Not mentioning the variety would indeed be confusing for the consumer – especially in that day an age when a lot of wine consumers from the New World buy mostly by the variety. It would be counter productive for the producers to add to the complexity (or the mystery) of French labels. Let’s try to help the consumers understand, buy and appreciate our wines. Thanks for posting this. I have been following this issue at least since 2001, when I first met Jean Michel Deiss and other winemakers. You may also want to read the article, linked below, which contains a bit more detail and other quotes. Personally, I agree with you: Alsace is about both the grape(s) and the place(s). Previous post: Wines for guys or for girls? Next post: A huge discount, good PR?